We’d love your help. 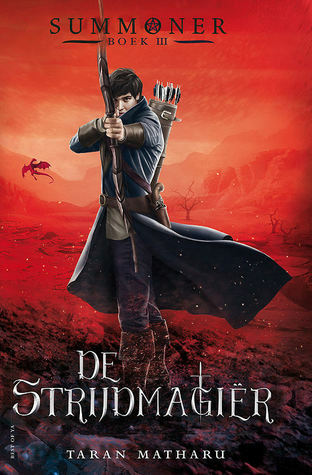 Let us know what’s wrong with this preview of De Strijdmagiër by Taran Matharu. To ask other readers questions about De Strijdmagiër, please sign up. When is the book coming out!?!?! I can't wait!!! THE CLIFFHANGER!!!! I can't believe I have had this book for a year and just now read it. This was a pre order for Pete's sake!! But luckily, I'm only spending time reading as many books as I can in two of my groups to get my badges and get books DONE! This one now gets its place on the shelf with the first two. Of course now there is a prequel coming out in May. Not sure when I will get to that one as I will surely be in chemo when that comes out. I'm so happy this was a great ending to a great trilogy! I truly ho I can't believe I have had this book for a year and just now read it. This was a pre order for Pete's sake!! I'm so happy this was a great ending to a great trilogy! I truly hope to re read this set again in the future, all at one time! Well... how do I start. Firstly, this series is for fans of the following. Harry Potter ( I know thats cringe because everyone says that but just bear with me. ) Pokemon... yes you read that.. Pokemon. Warcraft and Skyrim. Its set in a fantasy world with a cast of amazing, diverse characters. The premise is that some people can summon demons, making them summoners and they go to a school to learn what that means. I wont say anything else because I want you to not be spoiled .. so READ THIS SERIES. Well... how do I start. Its set in a fantasy world with a cast of amazing, diverse characters. The premise is that some people can summon demons, making them summoners and they go to a school to learn what that means. I wont say anything else because I want you to not be spoiled .. so READ THIS SERIES. This is the best finale to a fantasy trilogy i have read in a while.. considering i just devoured the full book in one sitting today, I think that proves I love it. OK,.... Taran.. this next bit is for you.. I am so incredibly happy that I went into your publishers offices that spring day two years ago. I remember when was briefly told in passing about this new, amazing fantasy story that is coming out that following May and that it was something they knew i would love. Then I remember when I nearly was able to take a copy home, but then was promised one would be sent to my home the following day. Two days later, a package arrived. In that package was more then just a book. It was the gateway to a friendship that i cherish close to my heart. I remember us connecting over the fact that i was the first person to leave a review for The Novice online. I remember meeting up for the first time for pizza and a chat. Now, after endless meals out, drinks and laughs I am so glad I can call you my friend. The future is so bright for you Taran, I look forward to clapping for your success as we watch you grow and conquer. "..."I am friend to both dwarf and elf. I am a summoner and a trained battlemage. A noble-born with the upbringing of a commoner and the record of a criminal."..." The very high for me rating comes mostly from the emotions of adrenaline this book engendered, as well as the affirmation of good old "Good vs Evil" plot. Honestly, if I start thinking critically, maybe I would be inclined towards something closer to 3.85*, but I don't want to "adult" right now, so I am going with the higher:):):) However, if I get nit-picky about it, I have to mention that the plot was somewhat on the simple side, the characters a bit one-dimensional, the pace was OK, but a bit rushed at the end, when we could have really used some more information and things that happened off page could have been explored more. The writing itself was better in this third book than any of the previous and you can see the growth the author has achieved in his short published life:). His strength is in telling the story in a manner which provokes emotion without being angsty or overly dramatic, and this will have me coming back for more of his works in the future for sure. You're never gonna keep me down"..."
This is the theme song of Fletcher and the gang, which was running on a loop in my head while reading. The Elf, the Dwarf, the Human, and their Demons constantly encountered new obstacles, never having time to celebrate even for a moment when they would get out of one difficult situation, because they would fall even deeper into another... It was infuriating how many times everyone would have benefited of helping one another, since the threat of War and Invasion from the Orcs and Goblins was eminent, and how every time personal petty rivalries and spitefulness made things horrible for all involved and weakened their position to protect the land. I liked the young King, but I also did not respect him, for he obviously had convictions, but no guts to stand up for them. As people say, when there is a will, there is a way, and I thought that he always chose the way for someone else to bail him out. However, the Dwarfs, The Elves and even the Gremlins found a way to see the bigger picture and not get bogged down in racism and hatred. Thank goodness for good friends! And that cover!!! How can anyone resist the gorgeous art of the covers on all the books in the series!!! Now I wish you all Happy Reading and many more wonderful books to come!!! According to that (new) cover, it's welcome to Mars, I guess...with Fletcher looking very, very dangerous. And of course, Ignatius in the background, having evolved...sorry, metamorphosed from a cute little Salamander to a bigger, be-winged, and now, more Toothless-like than ever, Drake. So at last we come to the end of the Summoner series...or is it? Not with this level of high action, and highly relevant social commentary as the previous books' allegory for the rampant prejudices of today's wor According to that (new) cover, it's welcome to Mars, I guess...with Fletcher looking very, very dangerous. And of course, Ignatius in the background, having evolved...sorry, metamorphosed from a cute little Salamander to a bigger, be-winged, and now, more Toothless-like than ever, Drake. So at last we come to the end of the Summoner series...or is it? Not with this level of high action, and highly relevant social commentary as the previous books' allegory for the rampant prejudices of today's world continues to develop, and deep emotional investment because we the readers need Fletcher and Ignatius and all their comrades-in-arms to survive these trials, gorrammit! Naturally, some of them don't. But the ride there is loaded with all that action, right up to the very end. I'm not kidding - Taran Matharu gives this series a Deathly Hallows, Allegiant, Mockingjay-level final battle that takes a lot of lives, and a lot of energy, and propels the reader nonstop. This one's going in with King's Cage, Nemesis, and The Hate U Give in serious contention for this year's Pinecone Awards for sure. And thank God we're not done with this story world yet - even though the ending to this book, not unlike City of Glass or The End of Oz, leaves room to expect further adventures, Matharu's next book, The Outcast, will be a much-needed prequel centering on a younger Arcturus. Can't wait to read that one! All four books in this series including the prequel 3.5*'s. A good old school series where there's the good guys vs the bad guys and very little gray. This YA/Epic tale is well written and the thing I liked most about it was the world. The aether and especially the demon types were well thought out and entertaining. I did this series as a group read but also read it with my middle schooler at the same time. She enjoyed the books and it's a very safe series for tweens. Fantasy 101 for them to lea All four books in this series including the prequel 3.5*'s. I don't want to wait this long, I'm desperate for the next book.... And please tell me that fletcher falls in love with Sylva cause I ship them. I ship them A LOT. So yeah. This is just a suggestion that I would like to see in the book. The Battlemage was a good ending to the Summoner series. There were a couple of things that were left open ended that could be revisited if the author ever decides to continue the series, but everything was pretty much wrapped up nicely. What I like most about this series are the demons. I love the giant turtle demon that they encountered and I loved what we found out about Ignatius. Overall this is a good series with all the books being equally likeable. This is a YA fantasy series that I would The Battlemage was a good ending to the Summoner series. There were a couple of things that were left open ended that could be revisited if the author ever decides to continue the series, but everything was pretty much wrapped up nicely. What I like most about this series are the demons. I love the giant turtle demon that they encountered and I loved what we found out about Ignatius. Overall this is a good series with all the books being equally likeable. This is a YA fantasy series that I would recommend to any teen interested in reading fantasy. It's fun and not too dark. full of epic moments, adventures & battles! a bit slow in the middle. Chapter 15 & 31 were full of excitements! I don't want to wait this long! I am not sure how this has such a high average rating. I had really high expectations for this because most of the reviews are very positive. But I struggled through the entire thing and if it had not been the last book in a trilogy, I probably wouldn't have finished it. Matharu is a good writer in terms of style. For me it flows well and for the most part conversations feel real. And the first two books in the series were pretty good - I even liked book two more than book one and assumed this wo I am not sure how this has such a high average rating. I had really high expectations for this because most of the reviews are very positive. But I struggled through the entire thing and if it had not been the last book in a trilogy, I probably wouldn't have finished it. Matharu is a good writer in terms of style. For me it flows well and for the most part conversations feel real. And the first two books in the series were pretty good - I even liked book two more than book one and assumed this would be better, too! But the problem is that there seems to be no direction to the plot. Honestly, half the time I kept wondering what the hell was going on and how it would lead us to the conclusions. It also bothers me that it feels like all character development comes to a screeching halt. Especially when we don't see many of the main characters from books one and two for three quarters of the book! (view spoiler)[The main problem I have that I mentioned is the plot. There is NO DIRECTION WHATSOEVER. The first 125 pages or so is them riding on the back of a turtle through the demon dimension and having a small skirmish with the orcs. The next 200 or so is full of this weird political plot with the Dwarves which I like and could have been interesting, but it wasn't done well. It was also full of the most boring descriptions of Fletcher bringing Raleighshire back to it's former glory. the last 75 pages or so is finally more battle - BUT THEN THE BATTLE WITH KHAN IS HONESTLY 10 PAGES!? IF THAT!? I'm just so frustrated because focus of the first two is this prophecy with the orcs and there's always so much talk about the orcs in the first two books and they are almost completely absent. The longest part of the battle Fletcher fights is with GOBLINS, not even against orcs until Khan which doesn't last long. It honestly feels like Matharu realized he had run out of ideas for where he wanted to go with the plot or just didn't have his heart in it and filled the book with ramblings to make it longer. I have really enjoyed this series but this took it to another level I think. The world building takes it up a notch here as we see some new places and some old ones revived. It really works and transports you into that world quite perfectly. There's also some battle scenes that I thought were done extremely well. The characters are fantastic as always and Fletcher really grows and develops in this one and I really like seeing that transformation happen. Sylva though is a real scene stealer for me although she wasn't in this one quite as much. I must also mention the demon element and there's some excellent transformations here too. It's very reminiscent of Pokemon although as the books have gone in it has evolved into it's own shape. The plot was really good in this one and I really enjoyed it. I think this is what elevated it up to 5 Stars. It as twists turns shocks and surprises aplenty. I enjoyed this series very much but felt this book really took it to another level. I'm really hoping we get more of Fletcher and friends story although I am keen to read the prequel of sorts that came out a little while ago too. This will appeal to all fantasy readers really but especially to younger readers (and the young at heart)as they will connect very much with the characters. واو... کتاب فوق العاده ای بود..نمیدونم چرا یه سریا خوششون نیومده...به نظر من واقعا خوب بود. واقعا. بعد از کتاب اول کاملا از داستانهای تکراری فاصله گرفت وانگار...میکس بود...مگامیکس شاید بهتره چون اونقدر کتابهای مختلف رو قاطی هم داشت که نمیشه گفت.جالب بود. کتاب دوم و سوم رو توی یک روز و شب خوندم و واقعا دوستشون داشتم و پیشنهاد میکنم. اما ممکنه همه خوششون نیاد.هوم. 4.25 stars. Once again, Taran Matharu delivers another action-filled and engrossing novel of Fletcher and his demon, Ignatius. As the plot contains many surprising twists and turns; more than the average rollercoaster, this third book in the Summoner series had me turning page after page with excited anticipation. With more character development and even more battles to endure, Fletcher and his fellow protagonists must overcome seemingly insurmountable foes, battles and adversities from every qu 4.25 stars. Once again, Taran Matharu delivers another action-filled and engrossing novel of Fletcher and his demon, Ignatius. As the plot contains many surprising twists and turns; more than the average rollercoaster, this third book in the Summoner series had me turning page after page with excited anticipation. With more character development and even more battles to endure, Fletcher and his fellow protagonists must overcome seemingly insurmountable foes, battles and adversities from every quarter of the kingdom. Along the way, Fletcher matures and becomes a true Lord and leader, time and again rallying his new kingdom to band together against the numerous enemies facing them at nearly every turn. The plot was concise, the protagonists believable and the action non-stop. I truly believe that Mr. Matharu has an excellent future in the literary world of fantasy fiction, and the fourth book in the series, The Outcast, is due out in 2018. I eagerly await this upcoming work, and am confident that the author will not disappoint this reader. Fletcher is maybe one of the best characters I've read...he's just generally a likeable guy. The kind everybody wants in their corner. He shines in this book. The relationships he has with various characters are a joy to read. And since this is one of those fate-of-the-world finales, there's some heartbreak too. But that in itself is a kind of victory for authors, yea? They've made us care about these fictional characters. I still can't quite figure out if I'd classify thi Full review on the blog! حق با ایناک است. جلد سه به نسبت ضعیف تر از دو جلد قبل بود. This series is greatly unappreciated. Long gone the young boy from the pelt and instead stood a strong warrior. The character development through this series was outstanding. This series was original and was absolutely amazing. The politics was actually interesting rather than boring and the magic/demons system has a refreshing twist. Honestly this series just blew my mind and was about so much more than a young boy who was found to be special and went to a school. Highly recommended. I can't begin to describe how much heart and feeling this series has. I tear up with how much I actually feel at times and laugh at others. This is an incredible series and I can't wait to get to the next one! Good but maybe a little rushed. Wat een einde zeg ... die battles ... effe bekomen ... wat heb ik genoten van de avonturen v Fletcher en zijn vrienden. Gelukkig heb ik nog een prequel die ik nog moet lezen!! The Battlemage is the third book in The Summoner series and in this one, Fletcher and his demons, Ignatius and Athena as well as his best friend have to work their way out of the Ether they’re trapped in (without dying), and then catapult into the final battle between their home and the orcs trying to take it. I really enjoyed this book as always - and it had been almost two year I received a free digital copy of this book from the publishers/author via NetGalley in exchange for an honest review. I really enjoyed this book as always - and it had been almost two years since I read the second book The Inquisition. It did take me a while to connect all the characters and what had happened again (but thankfully I watched a couple of reviews of The Inquisition before starting to refamiliarise myself with what had happened, and this definitely helped). I just love the world and the different demons that I encounter every time and how all the demons really end up grabbing a special piece of my heart - such as Sheldon who looked after them in the ether just because he wanted to, to the immediate care I felt for Pria when Othello infused her. Ignatius as always was amazing, and he actually became Toothless in this book which I’ve been saying he reminded me off the entire time. I absolutely love Athena and how she cares for Fletcher. I liked how things happened once they got back to Hominium, though the prejudice around dwarves and elves and how useless King Harold was most of the time did make my blood boil a lot. I liked seeing Fletcher go back to his place of birth, bringing his own little mixed-race species village with him. I love those kind of nice, quiet scenes of a village being built (blame my Sim-loving, Castleville playing heart for that one) so I was sad we didn’t get loads of time there but the battles were pretty intense and really well-written. There was a pint about 80% in to the book where I couldn’t figure out how Taran Matharu was going to wrap up the story because so much was happening, and it seemed like there was no end. There were definitely points here where I had a lump in my throat too like when Atilla’s demon healed Ignatius before disappearing, and pretty much every time Fletcher described the love he felt from Athena and Ignatius. Wooow!!! What a book!! I loved every single thing about it and there's nothing I would change. First things first, this has become one of my favourite series of all times, hands down!!! I mean, it has everything a fantasy lover wishes for. Great world, awesome plot, dwarfs, orcs, goblins, elves, summoners and magical beings. They're not kidding when they say this series is a cross between Lord of the Rings, Harry Potter, Pokemon and I might add His Dark Materials. Trust me, you're in for a ride! Wooow!!! What a book!! I loved every single thing about it and there's nothing I would change. First things first, this has become one of my favourite series of all times, hands down!!! I mean, it has everything a fantasy lover wishes for. Great world, awesome plot, dwarfs, orcs, goblins, elves, summoners and magical beings. They're not kidding when they say this series is a cross between Lord of the Rings, Harry Potter, Pokemon and I might add His Dark Materials. Trust me, you're in for a ride! I like how even though the plot is complex and we have action in spades, you don't feel like you can't keep up. The flow is so beautiful and natural and you feel like you're there beside the characters. Speaking about the characters, omg I couldn't love them more! Beautifully penned with wonderful traits and so very real. I love Fletcher, Ignatius, Athena, Sylva, Othello, Arcturus and Lovett with my whole heart! I adore The Battlemage so much, I can't even write a proper review. I want to say how pleased I am with this ending of the trilogy even though it's bittersweet because there were many fallen characters. The series got better and better with each book and that is a rare thing. I want more in this series. Be them spin-offs or novellas. I want to know more about how Fletcher and his mom are doing, I want more about Fletcher and Sylva, also Alice and Harold, I want them to happen, oh and Othello, more Othello and Cress. I know for sure that another book is going to happen in the Summoner world, because it was written at the end of the book so I can only say, please can it be 2018 already?!!!!! If you haven't read the Summoner series yet, just drop everything and read it already!!! خب این هم جلد پایانی مجموعه احضارگر که متاسفانه اصلا شایسته ی همچین روایتی نبود. چهارصد صفحه اول عملا همش حرف از راهپیمایی،توصیف جن ها، خانه سازی، انواع غذاها، انواع سلاح ها و حرف از چیزهایی که نباید زده میشد گذشت واقعا هیچ پیشروی خاصی نداشت در حالی که در جلد های قبل پل ها چیده شده بودن تا در این جلد کلی هیجان داشته باشیم و بعد در صد صفحه آخر داستان تموم میشه با یک جنگ که سرنوشت تمام دشمنان فلچر مشخص میشه که به نظرم اون هم ضعیف بود. خیلی ازجاهای کتاب اتفاقاتی شگفت انگیز میوفتاد اما هیچ یک از شخصیت ها اصلا سوال هم نمیکردن که چرا این اتفاق افتاده. I struggled though the first half of "Battle Mage" repetitive, slow paced and unexciting as it was. But what an outstanding ending for the trilogy. Epic battles, magic, friendship, betrayal, sacrifice, love, hatred and amazing plethora of emotions condensed in the last third of the book. I still believe that three average books could have been combined into one solid artwork. So in a few days my book club will be reviewing this book in detail...however right now I just want to say, AHHHHHHHHHHHHHHHHHHH I FINALLY GOT LOVETT AND ARCTURUS!!!!!! EEEEEKKKKKK. Sorry, I'm mostly composed now. The first one was okay, the second one was much better and this one was BLOODY SPECTACULAR. I loved the prose, loved the pace, loved the battle scenes, loved the progression, how everything was timed perfectly: the trip into the ether, the journey back, exposing the Triumvirate, getting back to Raleighshire and then finally, the last epic fight against the Orcs. I was a little bummed about not knowing the origins of the ether and of the world in general, as in who prophesized the war between the humans and the Orcs, what kind of ancient civilization used to live there thousands of years ago, but it was drowned out by the awesomeness happening around. Fletcher was an immensely likeable protagonist. He wasn’t the all powerful mage of his age but barely above average. I am so used to seeing the main characters in books being the savior of humanity that this was a shock. His possession of Ignatius was a stroke of luck and nothing more. He fought to be respected, fought to be adept and then succeeded. Also surprising was the writer’s decision to keep Sylva and Fletcher apart. It made perfect sense. The vast variety of demons, their fulfillment and mana levels was all pretty darn interesting. There was a glossary at the end but I kinda skimmed it. Ehehehe. The fact that Ignatius remained a Drake by the end of the among other itty bitty hints tells me that this is far from over. YAAYYY!!! Also, can you please appreciate how effing fantastic these covers are? Protagonist: At the end of The Inquisition, Fletcher's world got rocked when the prisoner he and his team were sent to recover wasn't Lady Cavendish as they thought, but Fletcher's own mother, long thought to be dead. However, before he could even let that twist faze him, they all had to jump straight into the ether, a place believed to be poisonous to humans. Fletcher's journey in this story is a pretty interesting one. His team looks to him as a leader and even when all seems hopeless he needs to think of something to get them through their ordeals in the ether. This isn't a role that Fletcher particularly likes as he hates the fate of others being in his hands. Over the course of this journey though that's not a feeling he can afford to have and he'll need to take action and lead his team if they're going to see their way out of the ether and protect the people of Hominum. World Building: We finally get to see the ether! I mean, we technically saw a bit of it in the previous books, but not to this extent. This story definitely deals heavily with the world of the ether and the demons that dwell within it. Of course, there is the matter of the albino orc, Khan, and his plans for the world, that's a story that is woven throughout Fletcher's journey, both in the ether and after they've escaped. (If you think the fact that they eventually escape the ether is a spoiler than I'm sorry but it really shouldn't be.) Anyway, I did really enjoy what we get to see from this story. There is another major element to this world building that takes up a rather large chunk of the story, but I feel if I talk about it I really WOULD spoil something pretty awesome. There isn't a whole lot of new stuff that we get to see of this world, at least not in quantity, but the quality and in-depth look at what more we get to learn and see are pretty exciting and incredible. Predictability: I'm looking back at the story and there wasn't all that much that I was able to predict. I mean, larger, more vague moments of the story such as the basic outcome for the main characters, sure, though even then there were a few things I couldn't predict. However, there was one thing, one thing that I was able to predict before ever even cracking open this story, and while I wish the author had taken this particular twist a bit further, it was still a pretty spectacular twist. As for the twists I was unable to call, there were some pretty intense things that go down in this story. This is an author that wants to show harsh realities over idyllic dreams and that means that things aren't always going to go the main characters' way, and well, that makes for some tension filled twists and revelations. Ending: So I'm reading this story and noticing that I'm getting conspicuously close to the end. I mean, extremely close and while I can definitely see the potential for a final climax coming, it wouldn't be THE final climax of the series. As the end gets nearer and nearer I feel as though I've been lied to. I had heard about a "fourth" book in this series but was assured by the author that it was a prequel and that there would be a conclusion to the main arc in this book. As the end gets ever closer I begin to wonder if I wasn't given the full story and instead, like, ten chapters or so were missing from the final version. No, instead the ending is very rushed. There is closure, and THE final climax to this series does happen, but it all felt too rushed. There were so many things left to solve that are more or less addressed by the end, but honestly, as much as I hate this author's cliffhangers I kind of wish the "fourth" book would have been an extension of this story and given this story the ending that it deserved to fully flesh things out. Taran Matharu is the New York Times bestselling author of the Summoner series, which has been translated into 15 languages and has sold over a million copies. He was born in London in 1990 and found a passion for writing during early adolescence, beginning his first book at 9 years old. Straight after graduating with a First Class degree in Business Administration, Taran was keen to explore a new a Taran Matharu is the New York Times bestselling author of the Summoner series, which has been translated into 15 languages and has sold over a million copies. He was born in London in 1990 and found a passion for writing during early adolescence, beginning his first book at 9 years old. Thereafter, while taking time off to travel, Taran began to write ‘Summoner’ in November 2013 at the age of 22, taking part in ‘Nanowrimo 2013’ and sharing his work on Wattpad.com. The shared sample of the story went viral, reaching over 3 million reads in less than six months. Taran went on to launch his professional writing career, and has never looked back.